In a decision I regret to this day, we opted not to buy protective gear. Photo credit: Jay Gooby, CC BY 2.0. Beekeeping 101 was a six-week course that met for two hours on Monday nights, in the Arboretum’s barebones community room. My husband and I, along with 30 other aspiring beekeepers, sat at long tables, our textbooks open to that night’s lesson while the instructor droned on. Each week he spoke about a different topic — Anatomy and Development, Social Systems, Diseases and Threats. I took detailed notes, mostly to keep myself awake. I’d signed up for the class almost entirely because of Vanishing of the Bees, a documentary my husband and I watched a few weeks earlier. Despite hearing rumors that the bees were in danger, I’d mostly ignored their plight. The documentary scared me straight. As soon as it ended I turned to my husband, wide-eyed and terrified. “We have to save the bees!” A few weeks later, our rescue mission began. Okay, fine. My interest in beekeeping wasn’t entirely charitable. I also hoped we could make a little money along the way. Honey is basically liquid gold, and we were already raising happy chickens in our backyard. By getting a few hives we could save the bees, and in return the bees could save our bank account. It would be a mutually beneficial relationship. Six years and three attempts later, we’re still not swimming in liquid gold. As it turns out, beekeeping has a number of startup costs and a steep learning curve, which can be a cruel combination. Below is a reckoning of what each attempt cost us, and what we lost and gained along the way. The six-week class, which included a textbook and a year’s membership in our county’s beekeeping association: $65. A hive tool, for prying apart sticky frames so we could inspect the hives: $7. A brand new paint brush for gently knocking the bees off the frames: $2. The cheapest smoker on the market (cool, white smoke keeps the bees calm by masking their attack pheromones): $35. And then there were the bees themselves. Each nucleus — a box containing a colony of bees, complete with queen, workers, drones, larvae, brood, and enough honey to get them through the transition to their new home — was $160. We decided to buy two to improve our odds. So, $320 for two boxes of buzzing, stinging bees that might or might not give us a few jars of honey. Some might call it a steal. In a decision I regret to this day, we opted not to buy protective gear. The veiled suits were expensive, and we were sure the bees would sense our goodwill and welcome us with open wings. They did not. This made working the bees terrifying, painful, and not at all the idyllic experience I’d imagined. (In related news, we discovered that my husband has a mild bee allergy.) 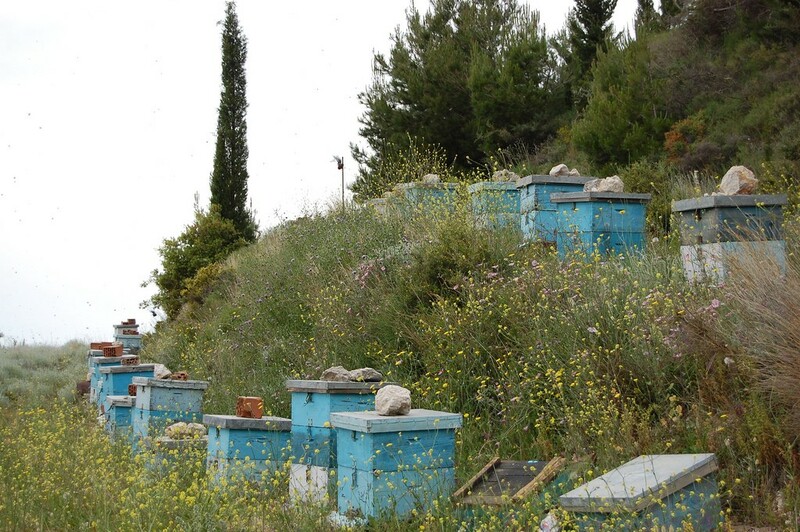 Rather than face the bees and risk their wrath, we avoided the hives and made up excuses to put off our inspections. One of our two hives failed fairly quickly. When we finally opened it, the bees were gone. This wasn’t a tragic vanishing act, but a choice. The bees had swarmed, abandoning us for better landlords. The second hive lasted two years, but we were afraid to take any honey for ourselves. We didn’t know how much the bees needed to get through the winter, and it seemed safer to leave them everything. A few summers later the hive became overrun with wax moths: parasites which infested the honey, ate the comb, and ruined the hive. We threw the boxes into our fire pit, watching as our investment went up in flames. The following year, we built new boxes ($180). We ordered new bees ($320). We splurged on two inspector’s jackets with hooded veils ($214) and two pairs of goatskin gloves ($50), because we’d learned at least one lesson. Everything else we needed for our second attempt at beekeeping, we still had. Sometime in the middle of the summer, after we’d had the hives for a few months, we also had to buy a new queen ($40). Once again, one of our hives had quickly absconded, and the other didn’t appear to have a laying queen. This was bad news; without a steady flow of new bees, the hive could not survive. The new queen came in a tiny cage, plugged in one end with a sugar compound. The cage was for her own protection — as an interloper, the bees would have slaughtered her, even though their own queen was gone. Instead, it took them a few days to chew through the sugar. By the time they reached the queen, her pheromones had transformed them from murderous mob to loyal subjects. The new queen took her rightful place on the throne, but she didn’t get there soon enough. The colony was weak, wax moths moved in again, and almost overnight the hive was infested, ruined, lost. Another failure, another bonfire. We decided to take a break from beekeeping and do some soul searching. I couldn’t eat honey for a year. New boxes: $180. New bees: $320. New hope: invaluable. We’ve only had our newest colonies for a few weeks, but already things seem to be going more smoothly. The hives are in a different part of the yard where they’ll get more sun. One is very active, full of bees and brood. The other is working more slowly, but still making good progress. Both queens are alive and well. When we approach the familiar white boxes, smoker in hand, I no longer feel panicked or scared. Instead, I look forward to opening the lid and seeing the bees hard at work, productive and driven by purpose. To watching their stores of honey grow, and seeing new bees emerging from the comb. To learning more every season and becoming a better beekeeper, one hive at a time. Because keeping bees, I’ve learned, isn’t a way to make a quick buck. It’s an investment in something bigger. When I see a honeybee coming home to the hives at dusk, legs laden with pollen and belly full of nectar, I know our investment is paying off. Christine Hennessey blogs about budget living for later bloomers at Better Than Never. She lives in coastal North Carolina with one husband, 15 chickens, two beehives, and an overweight dog.